Remember That Muse I Mentioned Following? 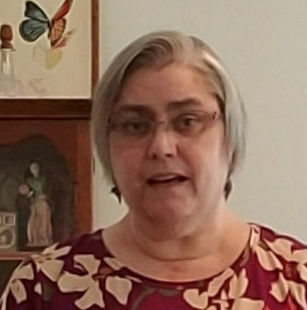 The Holiday Season has inspired my creative muse so… I will interrupt the history of my creative journey to show you how I have been following it. 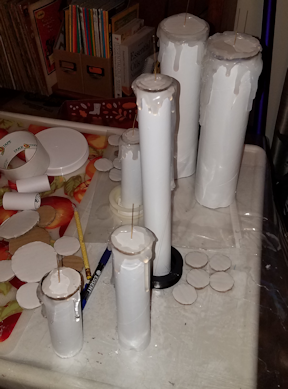 My initial idea was to paint the cardboard tubes my Young Living Essential Oils come in white. Then add red ribbon to create peppermint stick candles. Turns out my idea is good but my hot glue gun skills do not yet pass muster and my idea hadn’t been thought completely through yet. 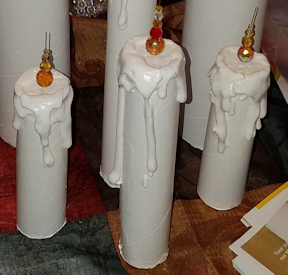 So I have tabled the peppermint stick candles for another day. Instead I used the materials as a learning curve and continued following the muse… Here is the result. Prime the cardboard tubes with the opaque white paint. This may take a few coats depending on the original color of your cardboard tube. Mine took three to cover the Young Living tubes. Allow to dry well. Trace the end of each tube onto cardboard to create an end of each tube. Repeat for the other end. As shown above. Pierce the center of the other cardboard round with the needle/pushpin. Then apply a small amount of hot glue to the tip of the headpin. Quickly thread the headpin through the hole and allow the glue to set. Apply hot glue to the edges of the cardboard disk so that the glued head of the headpin is tucked inside the tube. Do this quickly so the glue doesn’t cool and can seal the edges of the disk to the tube. Allow to set well. The tubes are too light to stand up well on their own so we need to add some balast. Using the hot glue, attach one of the cardboard rounds to the sand/pennies. Allow to cool then add glue around the sand/pennies and to the edge of the disk. Quickly insert into the cardboard tube and fit to the bottom and set the tube upright on your work surface. This allows the glue to create seal as it cools. Apply hot glue around the edge and down the sides a little to look like melting wax, This will be easier to do with hot temp glue than low temp but be careful not to burn your fingers! Continue adding until the “dripping wax” looks the way you wish. BTW, this eats up ALOT of hot glue sticks. Paint the candle, “wax” and all with the gloss paint. This will take a couple of coats for the candle and additional coats to get all the nooks n’ crannies of the “wax”. Using dabbing or pouncing stroke will help to “squish” the foam brush into those nooks as well. Allow to dry well. I gave it 24 hours. Thread the beads onto the headpin. Start with the largest size and work to the smallest. Then use your round nose pliers to roll the end of the wire into a loop or a swirl. To look like the flame has movement add a bit of a curve. Use decorative tape to cover the edge on the bottom of the candle. This adds some flair but also covers any messiness if things didn’t go as planned when gluing on the bottom. There ya go! 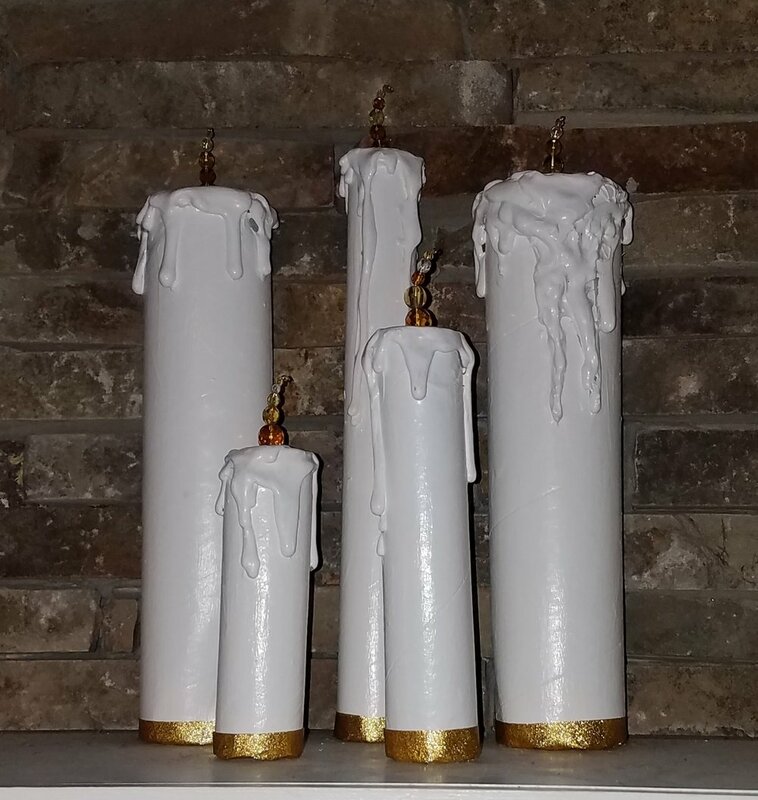 Faux Candles :) And my first non-bead related tutorial. Enjoy! P.S. I love Christmas, so, more muse meanderings may soon follow….